Mary A. 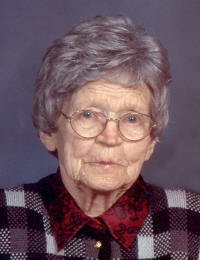 “Marie” Kampwerth, nee Richter, 98, of Breese died Friday, October 14, 2005 at Caring First. Inc. in Breese. She was born April 7, 1907 in Breese to Henry B. and Theresa (Maue) Richter; they preceded her in death. She married Alphonse B. Kampwerth on September 19, 1933 in St. Augustine Catholic Church in Breese; he preceded her in death on January 16, 1981. Also preceded in death by brothers, Anthony “Tony” Richter, Edward “Bandy” Richter, a sister, Kate Eilers, and a daughter-in-law, Luella “Lou” Kampwerth. Surviving are daughters Marge Scott of Breese, Alana (Jim) White of Knoxville, TN, Marilyn (Paul) Peters of Carlyle, and Bernice “Mech” (Jerry) Toennies of Damiansville. Sisters Sr. Anna Marie Richter OLVM of Huntington, IN and Dorothy Richter of Breese. Mary was a homemaker, and she enjoyed quilting and volunteering her time to the St. Joseph Hospital Auxiliary in Breese. She was a member of St. Dominic Catholic Church and Altar Sodality, Daughters of Isabella Precious Blood Circle 778. Funeral Mass of Christian Burial will be Monday, October 17, 2005 at 10 AM at St. Dominic Catholic Church in Breese with Fr. Patrick Peter officiating. Interment will follow in St. Dominic/St. Augustine Cemetery, Breese. Visitation will be Sunday, October 16, 2005 from 4 to 9 PM and again on Monday, October 17, 2005 from 8 to 9:45 AM at the Moss Funeral Home in Breese. Memorials may be made to St. Dominic Church, St. Anthony Church, St. Joseph Auxiliary Lights for Scholarship Program, or to Clinton County Relay for Life and will be accepted at the funeral home. Daughters of Isabella will pray the rosary at 7 PM Sunday Evening at the funeral home.